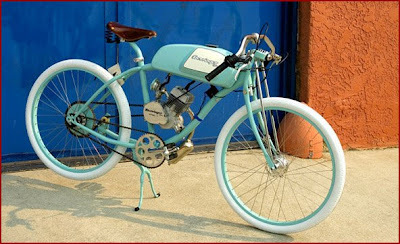 Carmakers such as Volkswagen have also discovered the retro trend in bicycles, reissuing two series of Bonanza bikes whose features includes banana seats, high handle bars and three gears. The company has produced 500 each of the models 1976 and Goal. The bike costs around 350 euros in Germany. While Volkswagen emphasizes originality in its remakes and Bergamont is using new materials to spur on a spirit of old bicycle purism, the manufacturer Cannondale is combining modern engineering with a classic appearance indicating a direction that the retro trend could take. Cannondale's 2008 model Vintage looks like a bicycle of yesteryear with its black matt finish and natural-coloured leather seat and handle bar grips. But the classic facade conceals modern-day accessories such as hydraulic disc brakes and an automatic lighting system. 2. 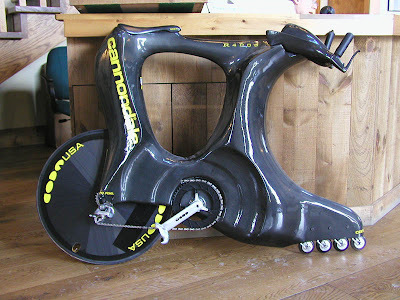 CANNONDALE PONG : Speaking of vintage bikes, remember the Cannondale pong prototype? Bizarre but really cool looking. James at Bicycle Design had a take on it on his blog two years back. 3. DERRINGER CYCLES : On a somewhat related retro note, an interesting shop called Derringer Cycles in LA, California and its industrial designer founder, Adrian Van Anz, carry the design system of thought that the most ideal urban vehicle is a cross between a Ducati and a vintage Schwinn, with a style that picks the athletic image of a board track racer. However, it must be said that it is still considered a motorcycle. 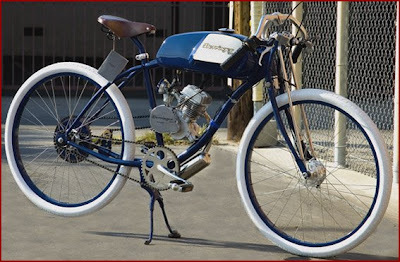 I have not seen many plug a 49cc 4 stroke Honda engine in place of water bottle cages and a multigallon fuel tank on the top tube of a retro pedal bike before, so this is a treat for the eyes. Did someone point out to proper stand over heights and blasphemous Q-Factors?! Hell yeah! 4. 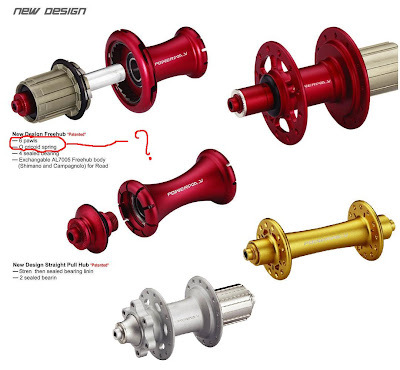 POWER-WAY INDUSTRIAL BICYCLE HUBS : I have to admit that I have not seen a well designed and gorgeous looking wheel hub anywhere like a Chris King. But the Taiwanese do know a thing or two about style as well. I'm very interested to know more about this whole patented 'O Cricoid Spring' design with 6 pawls. Sounds a lot like Greek to me right now. When it comes to putting quality information for the potential customer on their website, the Asians are a little behind. Apparently, the man at Power-way had a case of writer's block while on the side, also managed to mangle the English language like some Caterpiller D9 Bulldozer. Rest said, Power-way, we like your purts and Princippies! I'm looking at this post Ron... and thinking I don't think I've never asked you this. 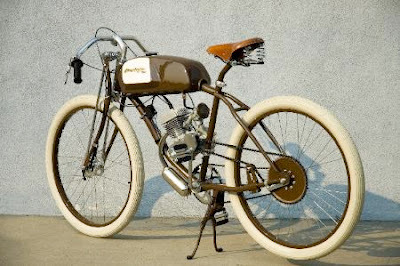 Would you ever be interested in building a bike? I mean not just building a bike... but designing something different... something with an edge... maybe crazy ... maybe fun.... what do you think? Sure, I would like to fabricate a bicycle, and the motivation would be the fun through all what could be learned. I've always wanted to take a framebuilding class when I settle down. But that may be any time soon with the kind of job I'm doing now. How can you call something with flat bars a track bike?? No need to look anywhere else for folding bike that can provide you mobility as http://www.myfoldingbike.com is available here to offer you one of the best folding bikes. I have a retro bike that I love to get out on. It just has a whole different feel and gives you a different kind of motivation.